The Bible is fundamental to Western culture. Political philosophers from Hobbes, Locke, Montesquieu, and Rousseau to modern political theorists such as George H. Sabine, Leo Strauss, and Sheldon S. Wolin have drawn upon biblical examples. American political leaders, such as Thomas Paine, Abraham Lincoln, and William Jennings Bryan all drew heavily upon the Bible. Today, most contemporary politicians display less familiarity with Scripture although many proudly proclaim themselves to be born-again Christians. Politics in the Bible has a simple goal: to help readers to think critically about how the Bible illuminates understanding of justice, leadership, and politics. For a political scientist, there are great advantages to studying the Bible. Students of the Bible have short texts to analyze, but they have a history of two thousand years of Jewish and Christian scholarly discussion. 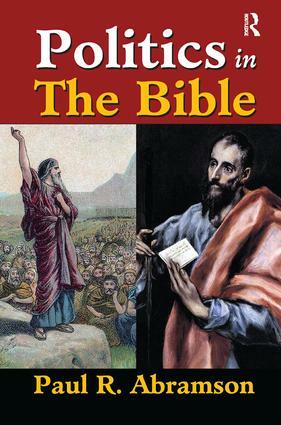 In that tradition, Paul R. Abramson analyzes stories drawn from eighteen of the thirty-nine books of the Hebrew Bible and fifteen of the twenty-seven books of the New Testament. Abramson argues that the Bible is a book that should be read even by those who do not believe it has any transcendent significance. One can choose to read it as the revealed word of God, as a source of Western morality, as a compilation of interesting stories, poetry, and history, or as a work of great literature. Although this book discusses selected stories that have political implications, it also considers parts that have literary merit. This unusual volume may stimulate new thinking about the Bible as a source of insight into political ideas.